On Saturday, October 1st, while more than 18,000 people gathered in uptown Charlotte for the “Race for the Cure”, the Charlotte Fire Department unveiled The Pink Lady. 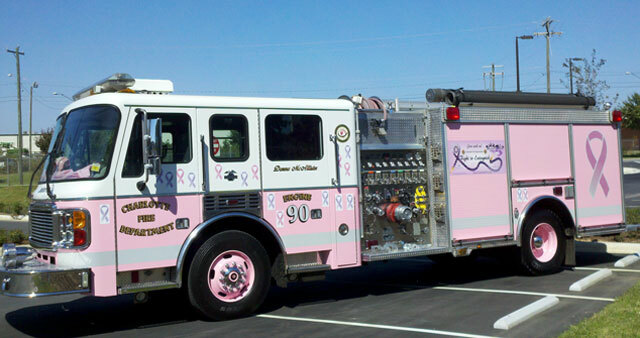 The eye catching apparatus serves a dual role: a working fire truck to be used as a reserve apparatus throughout the city, and a visible reminder to the public for awareness, prevention, early detection, and a vigilant reminder to all who see her regarding the fight against Cancer. Fire Chief Jon Hannan witnessed the power of a pink fire truck at the International Association of Fire Chiefs conference in Atlanta. He became aware of the presence that such a truck could have, and the impact on our community. Through the incredible generosity of Anchor-Richey Emergency Vehicle Services, a 2000 American LaFrance/General fire engine was transformed from its original color to pink and white, at no cost to the city. To honor all our members who have fought cancer, we are placing a ribbon bearing their name on The Pink Lady. The public will be able to honor their loved ones with a temporary ribbon on the truck as well. The Pink Lady will be available by request for events. The response to The Pink Lady has been tremendous. We look forward to sharing her with the community for years to come. The Pink Lady’s mission is to raise awareness in the fight against cancer and to support our members and their families in their fight against cancer, all types of cancer. To help in our goal of raising awareness, the Pink Lady will be available for requested cancer related events. Scheduling an appearance of The Pink Lady can be done through the Charlotte Fire Department website (opens in new window).